Imagine a Weeping Angel mob spawner. Haha! Damn ocean's sneaking into mines. Sadly, TNT doesn't asplode obsidian. Just reading this title made me go "FFFFFFFFFF-"
Location: Where ever I wake up. I don't think so. I like Doctor Who... but Weeping Angels have no place in Minecraft. Besides, I'd whoop all their asses with my mining pick and then build something out of their corpses. I'm a vindictive like that. It's an interesting concept though, if you want something like that...I'd suggest something like a Block Chameleon. Just some random mob that has the ability to turn into a block like form (Matching its surroundings in like a 10x10x10 area of where it is) when you're looking at it until it decides to maul you violently and eat your face. (It doesn't have to stay block while you're looking at it either. Just have a higher chance of attacking when it gets closer.) Have it make creepy sounds every so often so you need to look over your shoulder. Just my thoughts. I like brackets. Oh and lite brites. Science is good when it teaches you how to turn﻿ a million ungrateful foreigners into glass. How about a block, thats not actually a block, but a cube. It kills you by exploding your mind with its unfathomable logic. But, this would be the only possible thing that would make Minecraft creepier at this point. Would be a fantastic addition, if only by player mods now. The general idea of a mob that only moves and attacks when you're not looking is good enough. Weeping Angels aren't original, and wouldn't really fit into Minecraft as much as, say, a sort of stone about your size with glowing veins running through it. Actually, that does make me thing of another Dr. Who episode... "Stones of Death," or something, I believe. Tom Baker, part of the Key to Time series. Good stuff. Something like that could fit into Minecraft better. (And note that I wasn't thinking of Dr. Who when I came up with the idea...) You could mine it to death and get two cobble and two redstone, maybe? The redstone would be the creepy glowing bits inside it. The idea about a mob that would turn to stone in light is actually an even better one than this, I think. ESPECIALLY when torches begin to burn down. Oh yes. Minecraft is the sequel to the Rorschach test. A Weeping Angel thread again? First, it is an idea clearly stolen from Doctor Who making it a very dangerous subject that could get Notch sued to death. Even assuming there isn't a copyright issue, do you really want a mob so obviously stolen from Doctor Who in minecraft? Why not just have our own evil minecrafty mobs that are actually a little bit original? And even if you do still stubbornly want Weeping Angels. How the heck does that even work? If they're indestructible when observed, they're COMPLETELY indestructible since we really don't have ANY way to kill them. So what does that leave? Wall them off so they can't go anywhere? So now what happens when the next one spawns? and the next one? and the next one? Before you know it All hope of ever building anything nice is completely lost since you have to deal with this pesky mob that can cruise into your base, get stuck, and force you to ruin your nice designs to wall the darned things in. Soo... what? make them less indestructible? Make them out of obsidian or something? Why bother? Now they're not even particularly scary, ooh, I'm looking at him. let me come up and chop him to death with my pickaxe. It might take a while if you don't happen to have a diamond one in hand, but you can still get the job done. Not scary at all now, just boring. Even if I wanted weeping angels (which I do not) I really don't see how they could be implemented in minecraft to be a useful addition to the game. Herobrine is a weeping angel crossed with slenderman. He will be included in the update. I would totally support adding Slendy into the game. There wouldn't even be any copyright issues afaik, as he's a product of the internet and so many people have added to the lore already. Just think, you're minding your own business, running happily through your forest biome...Slendy follows you home. And I thought I was going to sleep tonight. Prepare to get Brunched in the face! 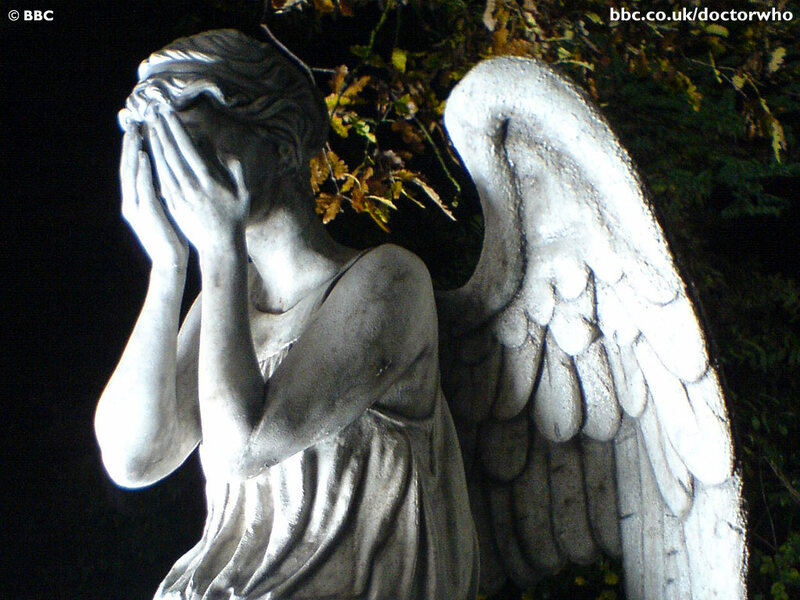 They shouldn't be weeping angel but should be fallen angel.